Life JacketsLife jackets for your whole family. Electric MotorsElectric motors for your boat. 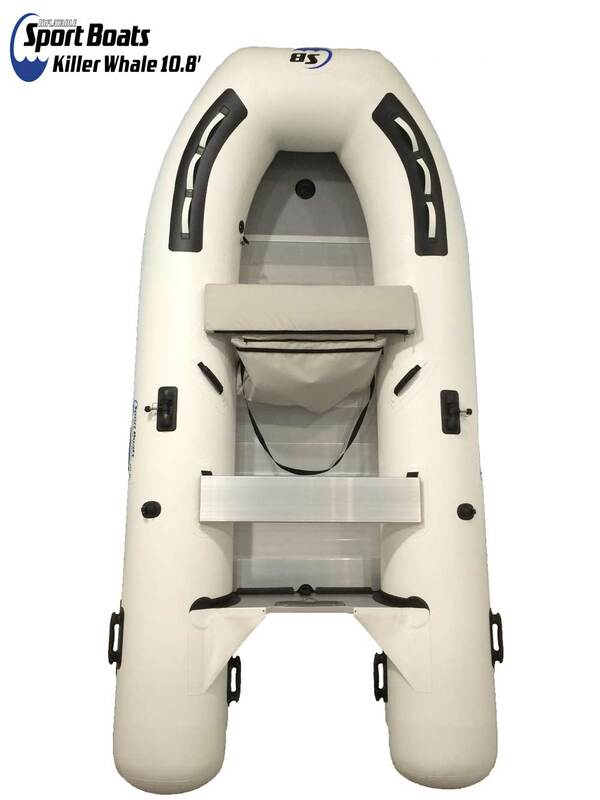 Inflatable Sport Boat Dolphin 8.8' air floor model is incredibly portable and easy to assemble in minutes. Unfold, blow up, and go within 8 minutes! Designed for boaters that want to inflate and take down regularly. Inflatable air floor is very steady and can handle 4 people or 1070 lbs. Handles up to a 10 HP motor. 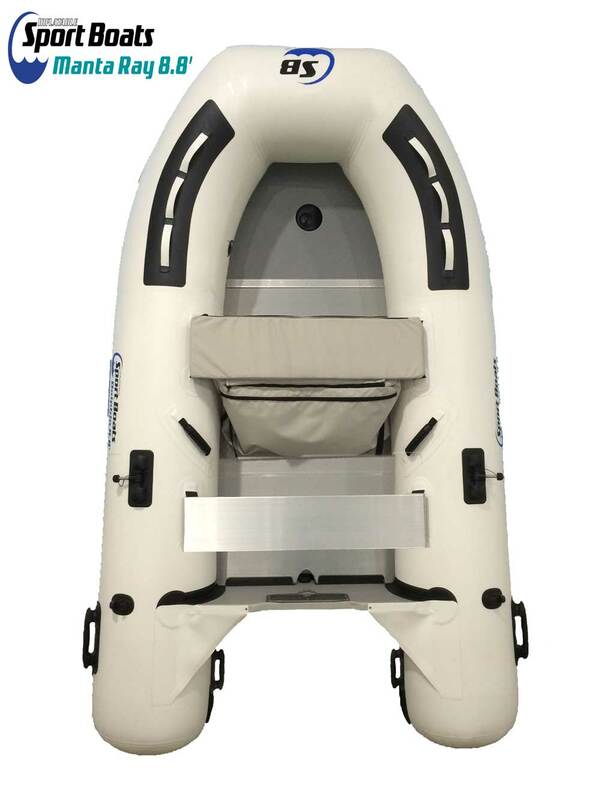 Inflatable Sport Boat Manta Ray 8.8' aluminum floor model is the perfect dinghy for getting from place to place. Perfect size for a family of 4. As steady as a bigger dinghy because of the durable aluminum floor and extended pontoons. Quality, convenient, loaded. 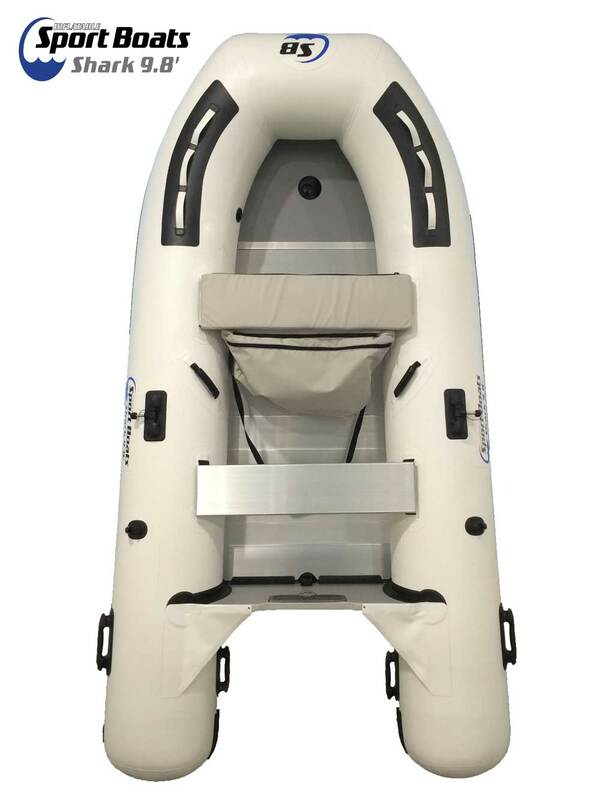 Inflatable Sport Boat Shark 9.8' aluminum floor model dinghy is loaded and comes with 2 bench seats. Handles 5 people and a 15 HP motor. Great size yacht tender or recreational inflatable boat for all your needs. Inflatable Sport Boat Killer Whale 10.8' aluminum floor model is our "Flag Ship" Sport Boat. 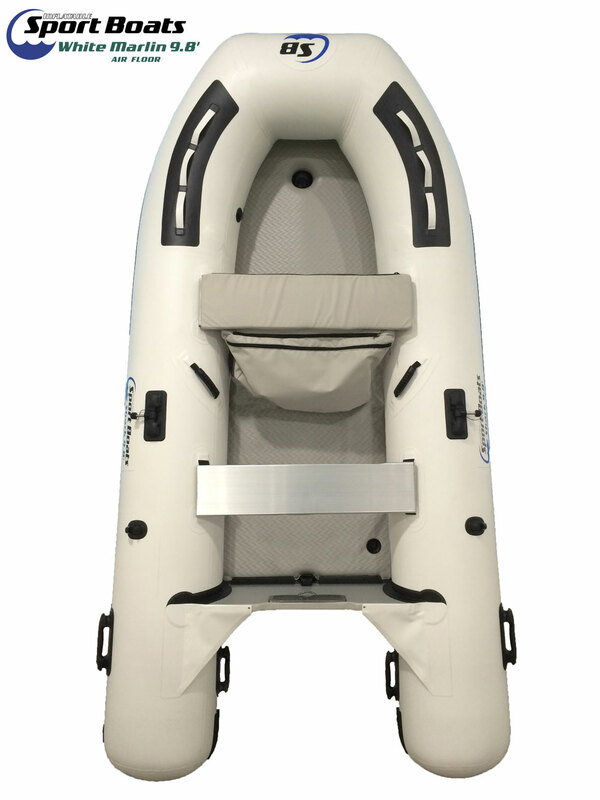 Handles 5 people or 1260 lbs and up to a 15 HP motor. This boat has all the bells and whistles. Everything you could ask for in a dinghy. Inflatable Sport Boat White Marlin 9.8' Air floor model dinghy is new for 2018. It is 1 foot longer than our best selling Dolphin 8.8' Air Floor. Handles 5 people and a 15 HP motor. Enjoy the ease of the air floor and smooth ride. Inflatable Stand Up Paddle Board is a premium inflatable SUP designed for "All Skill Levels". Ridged & durable pre-laminate double layer drop stitch technology. 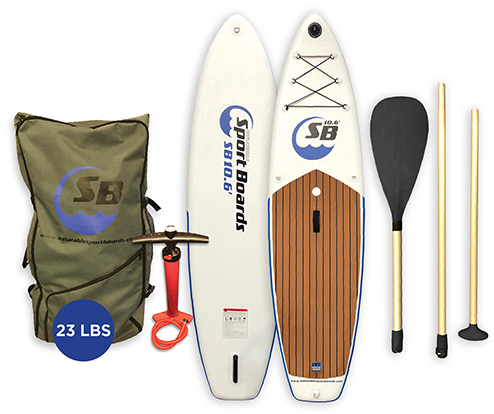 Rolls up and fits in an included SUP backpack that weighs 23 LBS with all accessories included, allowing you to take your board wherever your next adventure may be. USA Delivered Price - Free Shipping Have Questions? Add the inflatable pillow to your yacht dock for some much needed lounging. USA Delivered Price - Free Shipping Have Questions? Transforms your swim deck into a luxurious 10 by 6 foot extended swim platform. Inflates and deflates in 8 min and easily rolls for storage. USA Delivered Price - Free Shipping Have Questions? Inflatable Sport Boats have a multifaceted purpose in both fresh and saltwater environments. These inflatable dinghy tender sport boats are built tough for rough ocean water, emergency situations, tendering, fishing, or on a calm pond. Regardless of how you use your dinghy, you can rely on the quality and durability of your Inflatable Sport Boat. 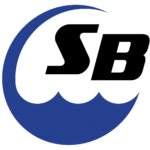 We stand behind the quality of our Sport Boats and guarantee our 3 year warranty. 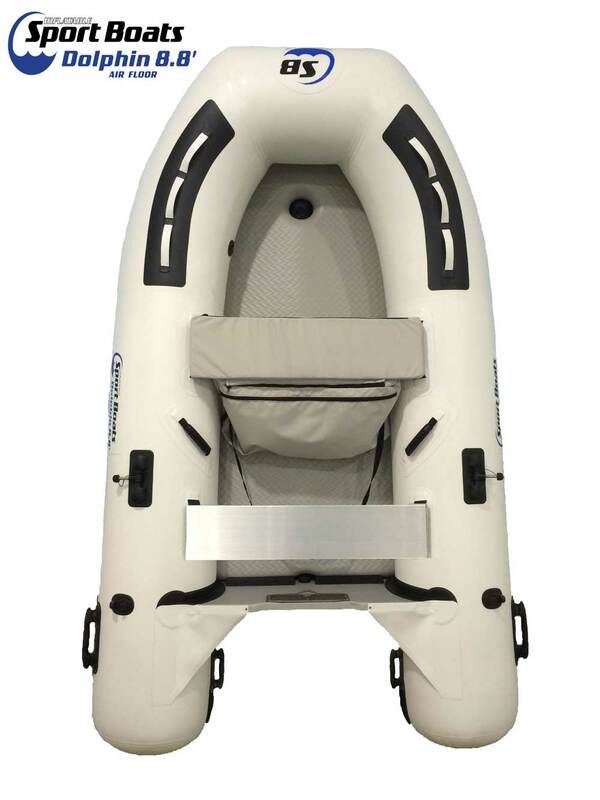 All Inflatable Sport Boats come with a seat cushion and bag included in box. The bag is incredibly handy and removable. Comes with a shoulder strap to carry your gear easily. Free $50 value. All accessories are made of high quality marine grade stainless aluminum. Fully aluminum floors, seats, and oars are corrosion resistant and no degradation. Guaranteed to last longer then marine plywood. The sleek white contoured design was created by nautical engineers. The thick .9 mm, 1100 denier reinforced PVC material is oil stain, UV, and puncture resistant. All seams are HEAT WELDED and guaranteed for use in fresh and salt water. Glue and nose cones are the main failure point on all inflatables. So we eliminated nose cones and glue completely. Sport Boats are built to last. All Sport Boats have re-enforced transom areas allowing for heavier motors and transom longevity. All Sport Boats have 30 inch extended pontoons that allows the boat to plane faster and handle larger motors. 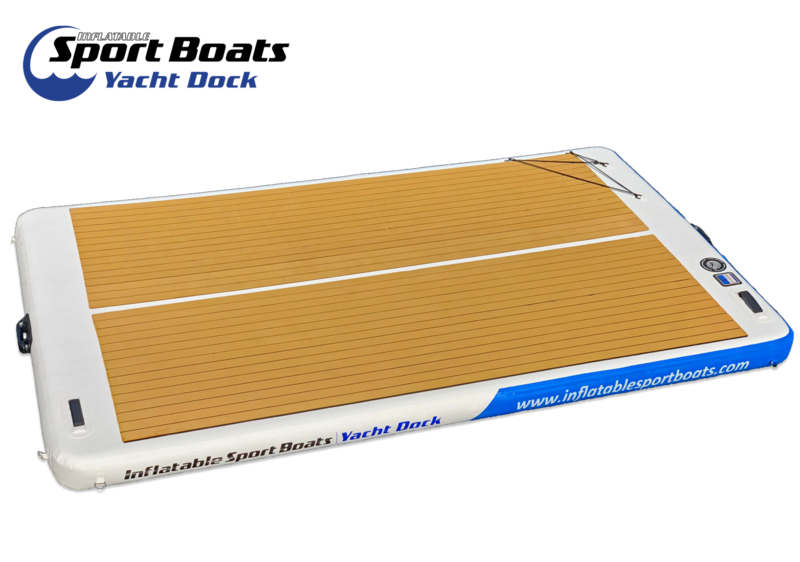 Designed to improve rear buoyancy and help your Sport Boat distribute weight equally while taking off. Check out our informative Youtube channel for help with your Inflatable Sport Boat needs. We ship same business day if you place your order before 3 pm PST. All products are heavy and are double boxed for safe shipping. We guarantee your product arrives safely. Industry leading inflatable boat warranty. Always backing our products with our word.